Tim Geithner: What will be his legacy? His stewardship of the US government finances came during some of its most stormy periods. As Timothy Geithner leaves the treasury, how will he be remembered? When Mr Geithner took office as America's treasury secretary in January 2009, the economy was a shambles. The country was haemorrhaging jobs (almost 600,000 that month), home foreclosures were up 18% from the previous year, and the banking sector was in the midst of a deep crisis. Is it any surprise that Mr Geithner has opted not to stay on for a second term? Now, as he packs his bags and prepares to leave Washington, Mr Geithner leaves behind a decidedly mixed legacy. In his early days on the job, his major priority was to help rebuild America's shattered financial system. If Wall Street wasn't fixed, he argued, the broader economy would struggle. Those fixes, however, would prove controversial. On 10 February 2009, he outlined proposals to stabilise banks by having the federal government and the private sector buy some of the more toxic, hard-to-sell assets that were dragging those institutions down financially. He also mandated that they undergo stress tests to determine if they had enough capital on hand. Following its announcement, the Dow fell 382 points and critics from all quarters quickly piled on. Among them was Nobel-prize winning economist Paul Krugman. "This is more than disappointing," Mr Krugman wrote in the New York Times. "In fact, it fills me with a sense of despair." 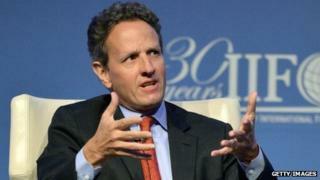 Critics said Mr Geithner was simply recycling the ideas of the Bush administration's former Treasury Secretary Henry Paulson. Others feared the plan favoured Wall Street while leaving taxpayers on the hook. In her book Bull By the Horns, Sheila Bair, the former head of the Federal Deposit Insurance Corporation (FDIC), one of America's chief bank regulators, questioned whether Mr Geithner's efforts to inject cash into the biggest banks were driven by his favouritism towards the banking giant Citigroup. "I frequently wonder whether, if Citi had not been in trouble, we would have had those massive bailout programs", Ms Bair wrote. "So many decisions were made through the prism of that one institution's needs." As widely criticised as he was, for a while it looked as though Mr Geithner's time in the job was over before it had even begun. Calls for his resignation quickly grew, especially after word leaked that Mr Geithner had fought against imposing limits on executive pay for companies receiving government aid. That decision left the administration powerless when bailed-out firms Merrill Lynch and AIG decided to pay out big bonuses, causing a huge public outcry. President Obama opted to stand by his man. Controversial or not, experts say the Financial Stability Plan has done its job. "Four years ago the banking system was on death's door," said Mark Zandi, the chief economist of Moody's Analytics. "Today it's as well capitalised, on as strong financial grounds as it has ever been." Mr Zandi says the stress tests were vital to restoring public confidence, getting the banks lending to each other, and ultimately lending to consumers. Some will never be convinced. Christopher Whalen, the co-founder of Institutional Risk Analyst accuses Mr Geithner of "essentially [serving] as a protector of Wall Street". Mr Whalen says that not much has changed from 2009 in the financial system. "If you really get underneath and you look at the substance of the changes they were pretty modest," he says of the regulations put in place after the crisis. Mr Geithner has struggled with the perception that he is not only the man who saved Wall Street, but he is also a product of Wall Street. Before becoming President Obama's point man on the economy, he was president of the New York Federal Reserve - a post he took up in late 2003. His role meant he had a front row seat at many of the important meetings that took place when the financial crisis broke. In fact, Mr Geithner is widely credited for the rescue and sale of the investment bank Bear Stearns to JP Morgan, and he supported the decision to rescue the American Insurance Group from bankruptcy. Mr Geithner, who was a protege of Bill Clinton's former treasury secretaries Robert Rubin and Larry Summers, worked in the international section. While there he helped craft the government's response to various global financial crises at the time. He learnt an invaluable lesson there, one that would become his guiding principle at Treasury - that to act too slowly may prove more costly. While that is true for the banks, having moved quickly to save them, he scores a lower grade when it comes to helping the housing market and re-igniting the jobs market. Neil Barofsky, who oversaw the $700bn (£435bn) bank bailout programme known as the Troubled Asset Relief Program (Tarp), has accused Mr Geithner of putting the interests of big banks before those of homeowners and the broader economy. In his tell-all book Bailout, the former Tarp head wrote: "There was never the same ferocity in dealing with the housing crisis as there was dealing with the failing banks." To be fair to Mr Geithner, more than half of the Tarp money was already spent when the Obama administration took office and the big banks have since repaid US taxpayers for the emergency loan with interest. Still, it may have a bearing on how Mr Obama's treasury secretary is remembered. Ultimately, Mr Geithner's legacy may be as the man who won the financial crisis but lost the economic recovery.